(L-R) Bella Popa as Sadie and Hillary Duff as Sharon Tate in the Saban Films’ thriller THE HAUNTING OF SHARON TATE. Photo courtesy of Saban Films. The Haunting of Sharon Tate was one big bad idea from beginning to end, but it is almost enjoyable to watch how everything went wrong. The Haunting of Sharon Tate is a new horror-thriller film written and directed by Daniel Farrands. The movie tells the story of the days leading up to the gruesome murder of Tate and her friends at the hands of the Manson Family, during which she was plagued by visions of her impending death. This film has been the subject of quite a bit of controversy because Tate’s family found it to be exploitative and untrue. It is totally understandable why they would feel this way. The movie takes so much dramatic license with the story that it may as well not be about Tate anymore. The title is even manipulative, as this is more of a psychological horror film than a supernatural one. It’s a shame that this story is so poorly-written because the Tate murders are among the most interesting and bizarre true-crime stories out there. The movie resorts to old and worn horror movie tropes in an attempt to pull suspense out of a well-known and predictable true story. There are good ways of making a true story feel exciting, and this is not one of them. And the ending? It is so out of left field that you won’t know whether or not what you are watching is real. 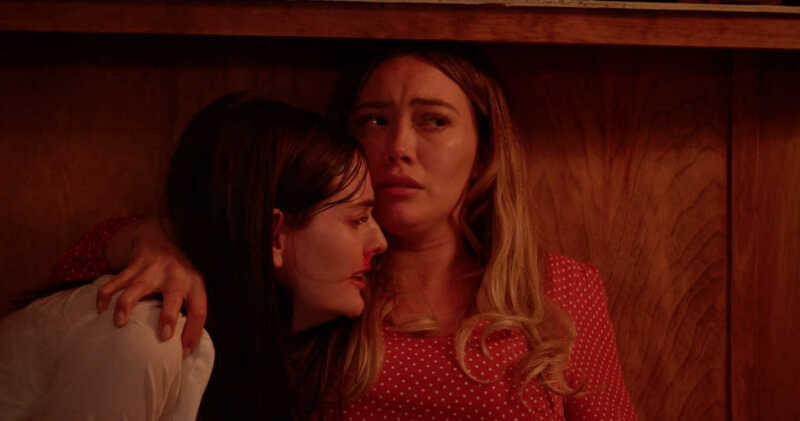 (L-R) Lydia Hearst as Abigail Folger and Hillary Duff as Sharon Tate in the Saban Films’ thriller THE HAUNTING OF SHARON TATE. Photo courtesy of Saban Films. One of the biggest issues with the script is that the characters are not well developed at all. Even Tate, who should be a likable protagonist, is turned into an ignorant damsel-in-distress. Some things that the characters do are just illogical. If Tate really had these visions, why didn’t she do anything about them? Why didn’t she try to leave. Obviously, the answer is because she didn’t leave in real life, but supposedly she also didn’t have these visions in real life. However, even that isn’t the worst part of the film. The worst part of the movie is the ensemble. Nobody in the film gives an A-list, B-list, or even C-list performance. Hilary Duff is shockingly bad as Tate, and it is obvious from the opening shots of the movie that all she is doing is a terrible impression. Some of her delivery is so ridiculously artificial that it’s hard to believe anyone thought she was a good pick for this role. thriller THE HAUNTING OF SHARON TATE. Photo courtesy of Saban Films. The technical aspects of this film aren’t much better than the acting. The cinematography is truly horrid — some of the worst to have the worst to come out of any movie this year. It looks slightly better than a student project, if only because the costuming looks professional. The editing is choppy and aggressive in a way that is unintentionally disorienting. The only part of this film that is remotely impressive is the imagery during the actual murders (and the premonitions of the murders, which we see multiple times). The murders look really disturbing and freaky. That being said, the way in which they were turned into generic slasher kills is definitely exploitative of tragedy and disrespectful to victims. Overall, The Haunting of Sharon Tate earns the controversy it has inspired. It is a manipulative, exploitative, and simply not very good movie, but you do have to see it to believe some of the ridiculousness it has in store. The Haunting of Sharon Tate is in theaters and on VOD beginning April 5. You clearly are of the generation who thinks everything should be presented in a bright shiny superhero package. I saw this movie with a packed audience at the Hollywood Film Festival where it won three awards (including Duff for Best Actress). I take reviews from frustrated, know-it-all, millennial film students with a grain of salt. You weren’t even a thought when these events occurred, and clearly you missed the entire point of the film: (spoilers) — this wasn’t a literal re-enactment of the true story; it all took place in purgatory AFTER the murders had already occurred and the “visions” were Sharon Tate in the afterlife trying to sort out the horror of what had occurred. It was pretty obvious to me when I saw it, and confirmed by the director in the Q&A. I thought the movie was smart, moving and quite respectful to the memory of the victims. It was a clever, transformative version of a real-life horror that would be incomprehensible to someone your age who grew up on a diet of sanitized horror films and superhero tentpoles. Anyone who remembers those terrible events of August 9, 1969 should give this a watch. It’s a rare film “based on true events” as tragic as this one that manages to find a grain of hope in its retelling. Thanks for taking the time to read and comment! I definitely respect your opinion and it is a valid one. Film is art, and art is subjective. I think that this film just wasn’t for me. You are correct in saying that I wasn’t around in 1969 when these events occurred, but even so, I don’t think that everything needs to be big and flashy. In fact, I think that one of the big issues with this film is that it takes this tragedy and unnecessarily sensationalizes it into a flashy horror movie. As for the ending, I did understand it. Personally, I wasn’t a fan of what it did. It was far too on the nose for my tastes. I did not discuss that in detail because I try not to spoil a film in my review unless it is absolutely necessary. Again, not to say you are wrong — it’s definitely unique — I just didn’t like it very much because it felt ridiculous to me. Your review does not indicate an understanding of the film or its final message at all — i.e., Sharon says (taken from an actual quote) that she lives in a fairy tale world … and probably always will. I don’t think there was anything “on the nose” about the ending, or even the film. It was hardly “flashy” in the style of today’s horror films, the gore was minimal, and you never actually saw Sharon Tate be stabbed or any blood come from her during the dream sequence that recounted the real murders (in chilling and factually-correct detail). It seems you went into this film wanting to hate it because the mainstream critics blasted it. I am old enough to remember films such as Wes Craven’s “Last House on the Left” and “I Spit on Your Grave” and even “Henry Portrait of a Serial Killer” which were considered taboo and “socially irresponsible” in their day. Hell, even the original “Halloween” and “Friday the Thirteenth” were slammed by critics and the religious right for their graphic depictions of violence. I’m not saying you aren’t entitled to your opinion, and I can absolutely agree to disagree, but I think in time this film, like the others I mentioned, will find its audience and you will be one of those from your generation who clearly did not get it. I did not find the film exploitative in the least. In fact, I found it redemptive. And I think the applause it generated (not to mention its current 70% audience rating on Rotten Tomatoes) shows that audiences, not critics, are the final arbiters when it comes to what films will be remembered. While I also respect all criticisms, I think you are unfairly assessing the reviewer of this film. He is very experienced and qualified in all genres. I think it’s great to have contrasting opinions to talk about, and I hope that you and everyone else continues to love the movies that work for you, but sometimes it’s okay to disagree.